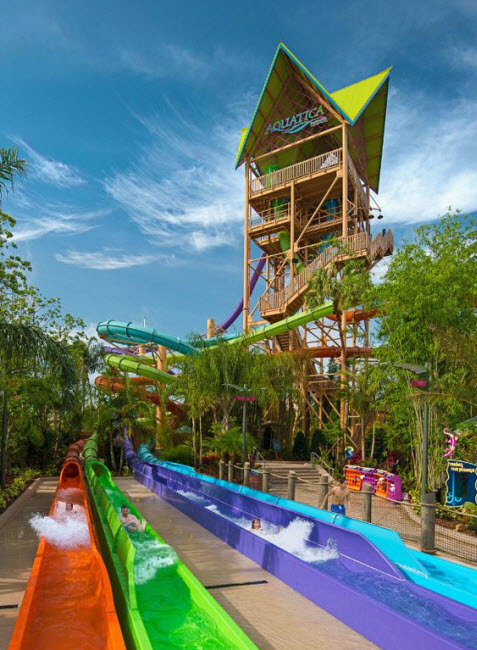 Aquatica, SeaWorld's Waterpark in Orlando, has added an eight-story high multi-drop tower water slide called Ihu's Breakaway Falls. Riders climb 126 steps to the top of the eight-story tower and step into one of three colorful breakaway boxes. The floor disappears beneath them and the drop 20-24 feet per second as they are launched onto a spiraling speed slide. There is also an open slide which is even steeper.